Summary: A new neuroimaging study reveals self control varies depending on the importance of the decision. Self control, researchers note, may also be augmented when people are asked to justify their decisions. Grocery shopping while hungry is a bad idea, often leading to regrettable surrender to momentary cravings. Yet we fall victim to this pitfall time and again, despite our rational mind knowing better. ASU Associate Professor of psychology Samuel McClure and researcher Ian Ballard wanted to know why. Their paper, “More is meaningful: The magnitude effect in intertemporal choice depends on self-control,” published today in the journal Psychological Science, may provide some answers. In it, the duo detail how they were able to use neuroimaging to show that self-control varies depending on how important a decision is, and that it can be augmented when people are asked to justify their decision. Scientists have long agreed that self-control is just another example of executive functions, a set of mental skills that help us do things like set goals, manage time and pay attention. They are controlled by an area of the brain called the frontal lobe. But trying to understand more about factors that might influence behaviors thought to be controlled by executive function — such as self-control — has been extremely difficult because the only way to do so was through behavioral experiments that required outside manipulation of executive functions, making it hard to separate the effects of manipulative factors from the effects of a person’s behavioral change. For example, if a researcher wanted to know how anger affects a person’s ability to drive, they might play loud music to manipulate the person into becoming angry. However, though loud music might indeed make someone angry, it could be their inability to focus because of the music rather than their state of anger induced by the music that affects their ability to drive. So for his and Ballard’s study, they first asked a group of subjects to make a choice between a small amount of money now or a large amount of money later. They found that not only did the pre-frontal cortex area of the subjects’ brains — the area thought to be responsible for engaging self-control — show heightened activity when making the decision, but that the activity was even greater when the option of a larger reward was introduced, a phenomenon known as the magnitude effect. They then repeated the experiment but followed it by asking the participants to rate their level of hunger, and found that hunger significantly affected whether they were willing to wait until later for a larger reward or take a smaller reward now, with those who reported being hungrier more likely to take the smaller reward now. Finally, they asked participants to imagine a scenario in which they won money in a raffle. They could either take the money right away or wait a month for a larger sum. Before they made their choice, they were told they had to justify it with an explanation. They found that when participants were asked to justify their choice, they displayed significantly more patience, preferring to wait for the larger sum of money. McClure and Ballard said the results of the study have implications for broad societal issues, such as obesity and addiction. “A lot of these things are self-control problems,” McClure said. “We don’t really understand how it is that the environment shapes how much control you have — although I think people who own restaurants and convenience stores know very well the opposite of that. That could mean adding more bike lanes on city streets to encourage people to exercise or adding calorie information to menus, something the FDA required all restaurants with 20 or more locations to do beginning in May. Scientists have long agreed that self-control is just another example of executive functions, a set of mental skills that help us do things like set goals, manage time and pay attention. NeuroscienceNews.com image is adapted from the ASU news release. It could also help to change the way you look at information, Ballard said. In particular, the magnitude effect, wherein people respond more to larger numbers, comes into play. 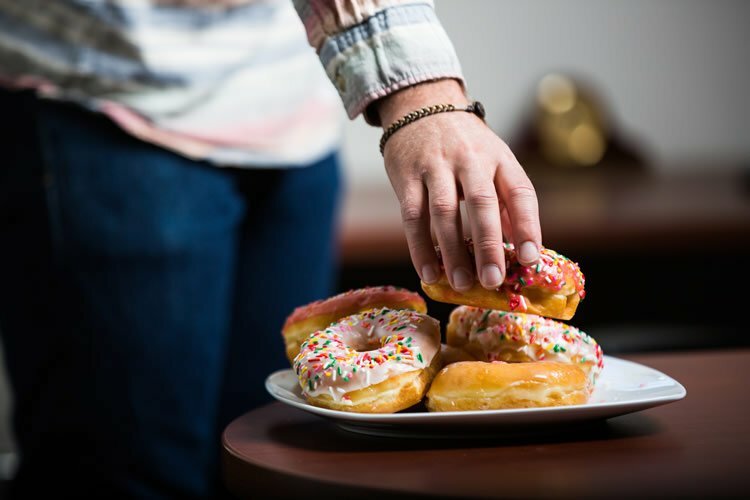 The seemingly larger number — 500 grams, as opposed to 1 pound — is more likely to stimulate self-control in relation to a diet or exercise regimen, according to the researchers. Simply looking at the information differently can lead to a different outcome. McClure and Ballard also recently received funding to conduct research on ADHD using the same theories and neuroimaging methods. They hope their work will eventually lead to interventions for such disorders, as well as insights into how to habitize good behaviors, such as running every morning. Image Source: NeuroscienceNews.com image is adapted from the ASU news release. Arizona State University “New Insight Into Self-Control Through Neuroimaging.” NeuroscienceNews. NeuroscienceNews,4 September 2017. Arizona State University “New Insight Into Self-Control Through Neuroimaging.” http://neurosciencenews.com/neuroimaging-self-control-7408/ (accessed September 4, 2017). Impulsivity is a variable behavioral trait that depends on numerous factors. For example, increasing the absolute magnitude of available choice options promotes farsighted decisions. We argue that this magnitude effect arises in part from differential exertion of self-control as the perceived importance of the choice increases. First, we demonstrated that frontal executive-control areas were more engaged for more difficult decisions and that this effect was enhanced for high-magnitude rewards. Second, we showed that increased hunger, which is associated with lower self-control, reduced the magnitude effect. Third, we tested an intervention designed to increase self-control and showed that it reduced the magnitude effect. Taken together, our findings challenge existing theories about the magnitude effect and suggest that visceral and cognitive factors affecting choice may do so by influencing self-control.